This UV Reactive Internal Recycler is a combination of handmade parts, assembled on a lathe, and then finished by hand. Dene Stephens manipulated and assembled the main worked sections that were used, and Ryan Huffy completed all of the shaping and finishing moves. The main body of the piece is 60mm X 5mm glass and sits atop a solid 50mm X 7mm squared foot. The internal funnel-shaped chamber helps to direct water flow and a gridded hollow disk showerhead perc means optimal diffusion. Both subtle structural details are keys to the high level recycling function of this piece; (kudos to Mothership for pioneering the design). 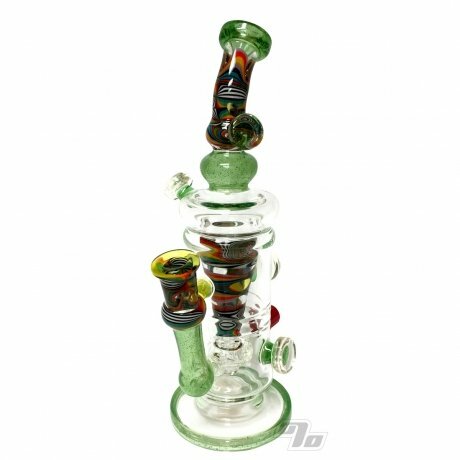 This piece is fitted with a threaded glass nozzle and matching cap for easy and convenient drainage; clean glass is happy glass! Overall stands 11 inches tall and measures 5 x 3.75 inches. 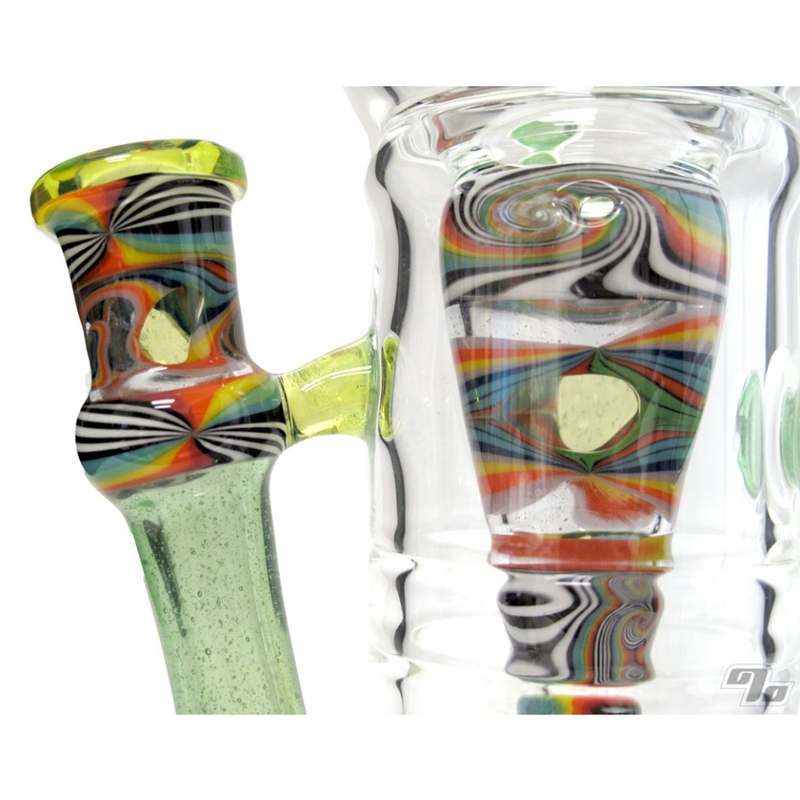 This piece features a special drill-mixed crucible-pulled UV tubing produced by Borro Studios in Springfield, Illinois. 'Key Lime' glows lime green under black light and is used in the mouthpiece, neck, and hand-shaped entry of the piece, plus as a lip wrap to the foot base. Huffy shaped the hollow disk showerhead perc by hand, then cut seven slits on a tile saw before flame polishing and double-gridding with NorthStar's Illuminati for a dash of vibrant bright UV color. This piece also features two different in-house cane pulls. One pattern is composed of soft pastels and NorthStar Glass' Plasma, a bubbly transparent smoke-like color that glows pink under black light. The other pattern is a classic 50/50 Rainbow & Jailhouse. Dene spun up two Pastel/Plasma 'beachball' sections and two Rainbow/Jailhouse 'opposing spiral' sections and then assembled them all in an encalmo style with the R/J sections bookending the P/P sections. Now, with a much larger piece of worked tube, he popped two holes on opposite sides and filled one with Illuminati and the other with Glass Alchemy's Electric Flamingo. So, in addition to the pink glow of the Plasma in the cane sections, opposing UV windows highlight the heavily worked internal drain chamber. Dene assembled the cane sections for the neck similarly to the internal chamber, except with an inverted color and pattern scheme. The neck features four linework sections stacked encalmo, with two P/P 'opposing spiral' sections bookending two R/J 'beachball' section. Also, similarly to the internal chamber, the worked neck features opposing UV windows, one Illuminati and one Electric Flamingo. Aside from Key Lime, the hand-shaped entry is made up of two R/J 'beachball' sections surrounding a P/P section of 'opposing spirals,' and also has opposing UV windows to match the neck & internal drain and complete the motif. Huffy used the designated worked cane sections to shape the mouth/neck by hand before taking it to the machine for assembly. After assembly and shaping, Huffy wielded the piece by hand to execute the finishing moves. Using the designated prep section, he tooled a 14mm female joint by hand and added an Illuminati lip wrap for additional UV flair. Huffy then attached the hand-formed 14mm female entry to the piece before mounting four Electric Flamingo button-shaped adornments, one on the neck and three on the main body. With the entry and adornments attached, he sealed the threaded glass nozzle to the bottom backside of the can, immediately adjacent to the perc for optimum cleaning potential. In the last move with the piece on a handle, Huffy bent the neck of the tube using a very hot annealing flame with extra oxygen before one final garaging. After bringing the piece back up to annealing temperature (1050°) in the kiln, Huffy grabbed the solid foot to operate by hand, making excellent use of Kevlar gloves and heat-resistant pads in effort to protect himself and insulate the piece simultaneously. So, with a 1,000° piece in one hand, he used a graphite reamer & paddle and a few moments of precision in the flame to shape the mouthpiece before stashing in the kiln for the final annealing soak and cool. A classic Huffy Glass 'H' logo is carved into the side of the exterior body, placed towards the bottom so as not to obstruct line of the sight to the heavily worked internal drain chamber! This piece was made in collaboration between Ryan Hoffman [Huffy] and Dene Stephens at Volta Glass Studio in Bloomington, Indiana and shows off the dearth of knowledge these two tremendously skilled flameworkers have accrued in their combined THIRTY SIX (36!) years on the torch! Both artists began working with glass in southern Indiana in the late 1990's, delving into what was then considered a deviant art form in a very conservative area of the country. In the 2000's, Dene took some time away from glass to tour as a percussionist and Huffy spent time studying at The Penland School of Crafts in North Carolina before opening a home studio in Brown County, Indiana. Dene was Huffy's first teacher in glass, and there has always been an unwavering mutual respect between them. 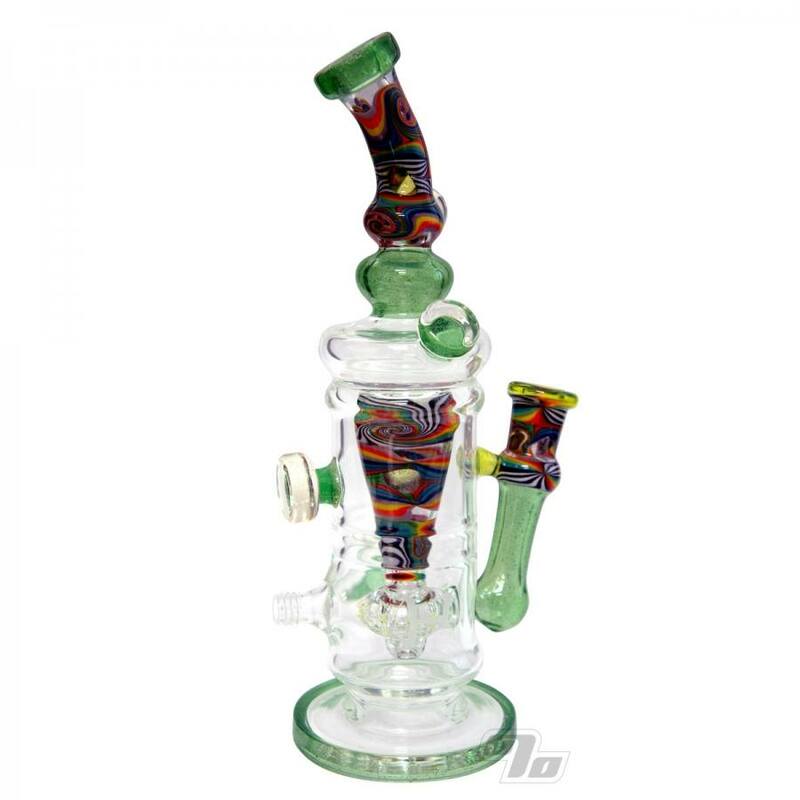 This Huffy x Dene Stephens internal recycler rig is a one of a kind meaning what you see is what you get. Risk free online ordering with Free Shipping (USA), Free insurance, Free Returns and No Sales Tax! You can even pay by major Credit Card, Bitcoin or Money Order.